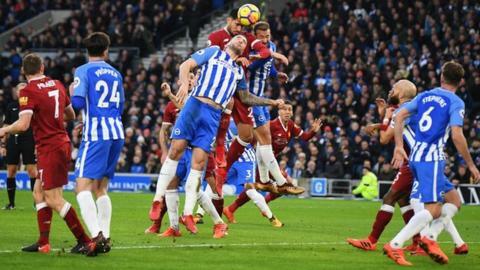 Liverpool manager Jurgen Klopp says his side still have "really hard work" in front of them despite continuing their phenomenal goalscoring away from home by hitting five at Brighton. The Reds moved into the top four of the Premier League for the first time since August after making it 15 goals in their past four away games in all competitions with a comfortable victory at the Amex Stadium. "It looks like we are flying," said Klopp after Liverpool's fifth win in six league games. "Unfortunately it's not like that, we have to work really hard. "We need results. In our calmer moments we are a really good team, but we need to carry on. "I'm much more interested in the next game. We need the points - we want to stay as close as possible to the teams in front of us." Emre Can powered a header beyond Mat Ryan from Philippe Coutinho's corner after half an hour and the Reds doubled their lead 79 seconds later following a sumptuous move. Mohamed Salah drove at the Brighton defence and picked out Coutinho, who slid a left-footed cross to the back post for Roberto Firmino to finish efficiently. Brazil striker Firmino made it 3-0 after Salah's brilliant assist before Glenn Murray, who had already missed two great chances, beat Simon Mignolet with a penalty following Jordan Henderson's foul on Shane Duffy. Brighton had chances to make it more nervy for Liverpool with a second goal, but Coutinho eased any concerns about a repeat of Sevilla's comeback from 3-0 down in the Champions League by scoring with a cute low free-kick then enticing Brighton defender Lewis Dunk to head into his own net. "The biggest disappointment is that you have to stay in the game," said Seagulls boss Chris Hughton. "They were always going to have more possession, but after 30 minutes we had had the best chance - and then within two minutes we were 2-0 down. "You have got to have a level of performance to have a chance. I thought they were very good and gave us a harsh lesson, but we were also below the levels we have set this season." Klopp's side move above Arsenal, who lost 3-1 at home to Manchester United, while Brighton drop to 11th in the table. This was another masterclass in the art of scoring by the Reds, but despite conceding a goal, it was also a triumph at the other end of the pitch. Klopp was without several defenders. Joe Gomez (virus) and Joel Matip (injured) were unavailable, Alberto Moreno was rested and Ragnar Klavan (ill) only on the bench - meaning the German fielded an unfamiliar back line in terms of both formation and personnel. Liverpool lined up with three centre-backs - and one of those was Georginio Wijnaldum, whose reputation was forged as a No.10 in the Netherlands and who had been brought to Anfield in July 2016 to score goals from midfield. Klopp also selected midfielder Can as the right-sided centre-back and handed Scotland left-back Andy Robertson his first Premier League start since 16 September. So it was perhaps inevitable that Liverpool wouldn't be rock solid at the back but fortunately for them, other than his penalty kick, Murray was profligate when the re-jigged defence permitted the home side chances. "We had big problems line-up wise," added Klopp. "But for this game today the formation fitted really well." Brighton frustrated Manchester United for more than an hour at Old Trafford last week before Dunk's unfortunate own goal proved the difference between the sides. This time, the Seagulls were well on their way to defeat when the defender's header into his own net made it 5-1 in the 89th minute. Dunk also put past his own keeper on the opening weekend of the season against Manchester City, and is now one own goal away from equalling ex-Reds defender Martin Skrtel's record of four in a single Premier League season - which the Slovakia centre-half achieved in 2013-14. After the game, Brighton boss Chris Hughton described Liverpool as the best offensive side his side had faced since Pep Guardiola's City. But his team helped their opponents to victory. In addition to Dunk's gift, the wall for Coutinho's goal failed miserably to do its job, Can out-jumped a static home defence for his first league goal of the season and they were hopelessly caught on the counter attack for Firmino's second goal. Brighton had not conceded more than two goals in a game before this match and their response to this emphatic defeat will be one of their biggest tests of character since winning promotion to the Premier League. Klopp made a further six changes to his side following the 3-0 win at Stoke City on Wednesday. Liverpool have made a total of 54 changes to their starting line-up this season in 15 Premier League games - more than any other side. Their fifth win in six top-flight games was achieved without Senegal winger Sadio Mane or England striker Daniel Sturridge making it onto the pitch from the bench, and with England midfielder Adam Lallana not available after his long lay-off. Klopp is likely to rotate his squad again for the Champions League game with Spartak Moscow next Wednesday as well as in the Merseyside derby at Anfield on 10 December. At the moment, it doesn't seem to matter which of his attacking players he fields away from home - lots of goals and positive results seem to follow. There were several contenders but Brighton could not live with the quick feet of Philippe Coutinho, who has had a part in 12 goals in his past 10 Premier League games (seven goals, five assists). Liverpool are unbeaten in six Premier League games, winning five of them, and they are just so quick and have everything in that front three. Mo Salah, Roberto Firmino and Philippe Coutinho just have so much pace and they also had Sadio Mane on the bench. They are one of the best counter-attacking teams I have seen in Europe. This was a real eye-opener for Brighton. Since his Premier League debut in August 2015, Roberto Firmino has netted 26 goals in the competition, more than any other Liverpool player. Brighton have gone five home leagues games without a win (D4 L1) for the first time since April 2015. Liverpool have won three consecutive away league games after enjoying just one victory in the previous five on the road. Glenn Murray has netted five goals in his last seven league appearances for the Seagulls after drawing a blank in each of the six before that. Mohamed Salah has played a part in 15 goals in his first 15 Premier League games for Liverpool - more than any other player for the club (12 goals, 3 assists). Brighton have a week to recover from this result - they go to Huddersfield next Saturday (15:00 GMT). Liverpool are in Champions League action in midweek as the Reds seek to confirm a place in the knockout stage for the first time since 2008-09 when they host Spartak Moscow (19:45 GMT) on Wednesday. Match ends, Brighton and Hove Albion 1, Liverpool 5. Second Half ends, Brighton and Hove Albion 1, Liverpool 5. Substitution, Liverpool. Marko Grujic replaces Jordan Henderson. Own Goal by Lewis Dunk, Brighton and Hove Albion. Brighton and Hove Albion 1, Liverpool 5. Attempt blocked. Philippe Coutinho (Liverpool) right footed shot from the left side of the box is blocked. Assisted by Georginio Wijnaldum. Goal! Brighton and Hove Albion 1, Liverpool 4. Philippe Coutinho (Liverpool) from a free kick with a right footed shot to the bottom left corner. Attempt blocked. José Izquierdo (Brighton and Hove Albion) right footed shot from the centre of the box is blocked. Substitution, Brighton and Hove Albion. Ezequiel Schelotto replaces Bruno. Attempt missed. Glenn Murray (Brighton and Hove Albion) right footed shot from the centre of the box is close, but misses to the left. Assisted by Shane Duffy with a headed pass following a set piece situation. Substitution, Brighton and Hove Albion. José Izquierdo replaces Isaiah Brown. Attempt missed. Dale Stephens (Brighton and Hove Albion) left footed shot from the centre of the box misses to the right following a set piece situation. Isaiah Brown (Brighton and Hove Albion) wins a free kick on the left wing. Offside, Liverpool. Roberto Firmino tries a through ball, but Philippe Coutinho is caught offside. Attempt blocked. Philippe Coutinho (Liverpool) right footed shot from outside the box is blocked. Assisted by Mohamed Salah. Attempt saved. Mohamed Salah (Liverpool) left footed shot from the centre of the box is saved in the centre of the goal. Assisted by Roberto Firmino. Attempt missed. Philippe Coutinho (Liverpool) right footed shot from a difficult angle and long range on the left is too high from a direct free kick. Best season so far - Hazard or Salah? Read more on Eden Hazard or Mohamed Salah - who's had the better season so far?